Intergalactic fanboys can now instantly transform their iPhone 4 into an unofficial Star Wars droid by applying this poor man's R2-D2 sticker to the back of their device. 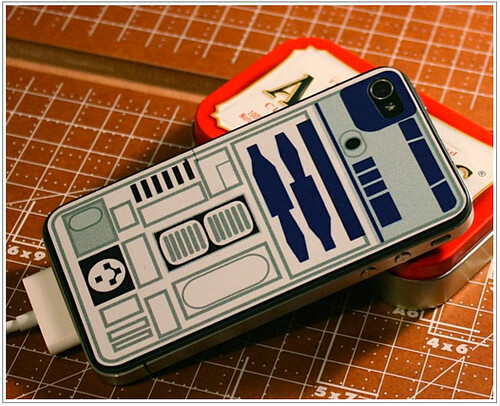 The official R2-D2 hard case was produced for 3G and 3GS units only. "This isn’t cheap sticker paper from an office supply store," the sticker's designer said, "It's certifiable vinyl powered awesomeness. Rated 5-7 years of outdoor life." Expect to pay $5 for the one and only droid you've been looking for. May the vinyl force be with you. STYLE GUIDE - Here's a beautifully unique iPhone 4 case design that serves up designer vampire style with the textured look of Victorian Filigree. The whimsical swirls on both the front and back of this 3D printed nylon snap case instantly transforms the look and feel of iPhone. "It is extremely durable, lightweight and also a bit flexible. After being hand-dyed a coat of non-toxic clear varnish is added to protect the color." Expect to pay $60 for your choice of several colors including true blood red and snowy white. Each case is made to order so plan on waiting between 3-5 weeks for fulfillment. 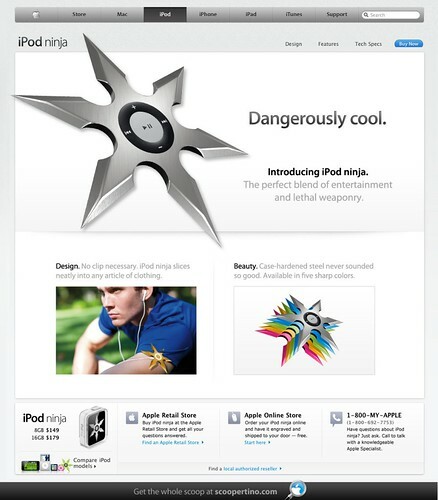 CUPERTINO, CA - It turns out that the Steve Jobs ninja star discovery at Japan's Kansai International Airport was actually Apple's newest iPod prototype device expected to launch right in time for holiday shoppers. Say hello to iPod ninja. It's the sharpest tool in the shed. “iPod ninja fits into that sweet spot between the iPod touch and a small handgun,” says Apple spokesperson Ted Wetmore." Read the entire twisted tale imagined by the minds at Scoopertino.com. Brilliant! SAN FRANCISCO - Jay Siegan, owner of the Red Devil Lounge has dreamed up a brilliantly evil splash of marquee humor outside his Polk Street nightclub. His lounge has been packed wall-to-wall ever since. The Red Devil Lounge is located at 1695 Polk Street at Clay in San Francisco. "Four full bars but crappy service." I'm so there! When a street musician set up shop to perform epic tunes on his didgeridoo at the new Covent Garden Apple store, security promptly asked the hollow toned soloist to shut it down. "Security outside their new flagship store in Covent Garden is strict," said photographer John Phillips, "No iDidgeridoo outside the Apple store." Of course, proper wi-fi-jacking is perfectly acceptable as long as you're using a Mac when parked within in range of the Apple store. But there will be no didgeridoo for you. According to the Business Insider, Facebook is secretly developing a mobile phone using Google's open-source Android operating system. With some 150 million mobile users, is Facebook really looking to grab its share of face time with a more social mobile experience by releasing their own handheld device? This grand "Face-phone" rumor began when TechCrunch posted a report that Facebook staffer Joe Hewitt was working on the stealthy mobile OS. 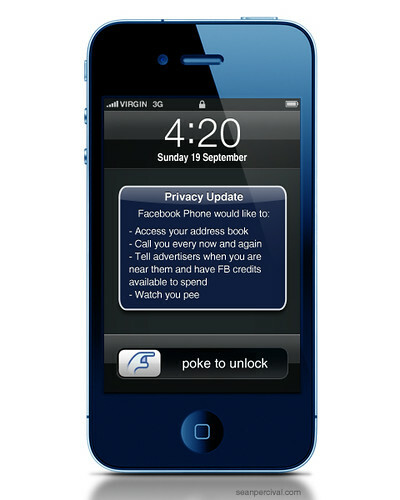 Hewitt is credited with creating all of Facebook’s iPhone web apps and native applications. "Two high level Facebook employees – Joe Hewitt and Matthew Papakipos – are said to be secretly working on the project, which is unknown even to most Facebook staff." - TechCrunch wrote. But that rumor skid to an abrupt halt when Facebook spokesperson Jaime Schopflin released an official statement to Mashable, publicly denying that the social networking giant is creating a "Facebook phone." "Facebook is not building a phone [...] building phones is just not what we do," Schopflin said. According to Jaime Schopflin, the company is not, in fact, developing its own mobile device. Consider this rumor smashed. The only thing I've been missing for my iPad is a third limb so I can use my magical device hands-free for common daily activities like skydiving, boating and driving. The iArm forearm mount provides the kind of convenient viewing companion I've desperately wanted since I bought my revolutionary iPad. You can use your iPhone and iPad at the same time. Jackpot! This mythical product box comes in a set of three for $8.58. It's the perfect way to give someone a brand new iPhone hiding inside. Shipping begins October 15th for those who love a genuine fake gadget gift box. Genius! This newest "Skyliner" retro iPhone dock is Freeland Studio's final design in a trilogy series which included the epic "Steampunk" model and the original "iRetrofone" release. Each unique creation was designed for compatibility with iPhone 3G, 3GS and iPhone 4. Scott Freeland's Skyliner is detailed with silver leafing and features a fully-functional handset for making calls. A notch is sculpted into the base of the dock to hide your USB charging cable below when your iPhone is properly docked. "I was trying to stay in the old retro mindset, creating something futuristic like people in the 1950's imagined things might look in the future." Scott Freeland told the iPhone Savior. Expect to pay $250 for this final concept in a series of three wildly original iPhone obsessed works of art, hand-sculpted and hand-cast in urethane resin. It's the perfect fusion of art and function for the Mac soul. STYLE GUIDE: Maybe if Mr. T made a guest appearance on South Park, this case might be considered a must-have collectible. This unauthorized Mr. T iPhone case looks more like it was slapped together at the YMCA on senior citizen craft day. But don't let my tragic review steer you away from snatching up such a classic hunk of handcrafted manly iPhone art. The Mr. T iPhone sleeve is made out of 100-percent felt, designed to fit 3G devices or even an iPod touch for $23 plus shipping. The constant public humiliation you'll suffer comes free after delivery. I pity the fool that misses out on this light skin Mr. T masterpiece. It's priceless! 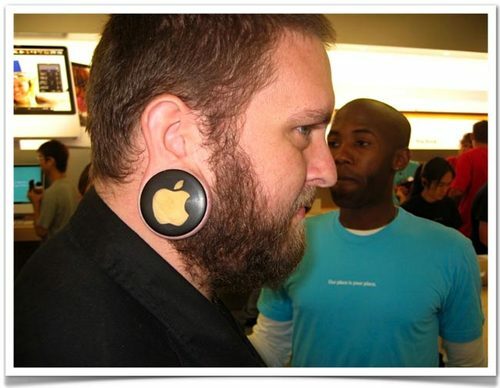 Forget about People of Walmart because there's a brand new web destination that's been created to lampoon the wildly fanatical People of Apple in this brilliant Machead hall of shame. The People of Apple site has been populating hourly with obnoxious photos of Apple faithful dressed up as iPhones, iPods, iZombies and of course it already features the unbelievable miniature horse taking up residence at the Apple store. A quick Who Is database search revealed an unexpected twist in this story. I discovered that the People of Apple domain is registered to the infamous Dan Lyons, (aka Fake Steve Jobs) who bought the domain for FSJ Media LLC on August 31, 2009. Meanwhile Lyons' Fake Steve Jobs website has not been updated since August 12th, which marks an unusually long writing absence for the fake one. There's no doubt that this Mactastic new web destination has the potential of becoming an overnight success as Apple worshipers from around the globe submit their fantastical photos of certified Mac madness in effect. Even if Dan Lyons is not the brains behind this one... somebody had to do it!